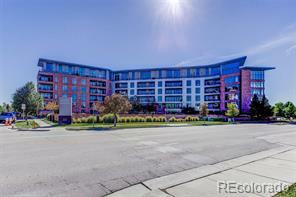 Fabulous 2 bed/ 2 bath condo in the heart of Cherry Creek! Located across the street from the Cherry Creek bike trail and within close walking distance to exceptional restaurants and shops. Spacious condo with many wonderful features including, wood floors, floor to ceiling windows, fireplace, a large kitchen island, granite countertops, stainless steel appliances, and a lovely outdoor space. The master suite has two large walk in closets, and a luxurious bathroom with large soaking tub. The unit has recently been painted and carpets in bedrooms replaced. Building amenities include 24-hour front door concierge service, community room with large outdoor terrace, fitness center, garage bike racks, conference room, and guest suites. Two deeded parking spaces and a storage closet in the garage. This is a true lock and leave home in a beautiful building and fantastic location!